Amur cork tree (Phellodendron amurense) is a relatively new invasive plant found in at least four Wisconsin counties. It is classified as Prohibited under Wisconsin’s invasive species law, NR 40. The female cork tree cannot be possessed, transferred, transported or introduced in Wisconsin. We ask that you report this tree to DNR because it is invasive here and in other states and DNR is mounting control efforts before it becomes widespread. DNR works with property owners to achieve this by providing advice, tools and resource opportunities. Amur cork tree is native to eastern Asia and has become established in northeastern states and Illinois often after being planted as a street tree. In some locations, cork tree out competes another strong forest invasive, common buckthorn. Like buckthorn, the dark berries produced on female cork trees are eaten and dispersed by birds, and can spread rapidly. Amur cork tree can be identified by several features, foremost the thick corky bark on older trees. Scrape away the bark and you’ll find the bright yellow cambium layer that gives rise to bark and cells that transport food and water. The leaves are pinnately compound and grow opposite each other. Crush the leaves and smell a citrus or disinfectant scent. 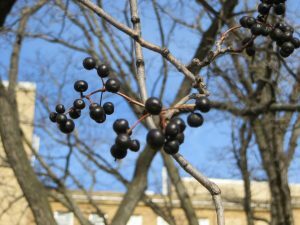 In fall and through the winter, female trees bear dark colored berries. Large Amur cork tree showing characteristic corky bark and bright yellow cambium that help identify this species. Photo by Mike Hillstrom, WI DNR. The dark colored fruits of Amur cork tree are readily eaten by birds which then, after the pulp is digested, spread the seeds away from the parent tree. Current efforts and known locations – we need your help. Amur cork tree is unique among plants listed by NR 40 in that only the female trees are regulated while male trees are not and can still be planted. However, in Illinois where control efforts took place, trees that seemed to be “males” later produced fruits. It’s not yet known if these trees were females that were not mature or whether Amur cork tree can, like some other plants, switch gender during its lifetime. Currently, the largest populations of Amur cork tree are spreading and naturalizing in the forests of Adams, Columbia and Dunn counties. For example, land purchased in the 1930s, now home to DNR’s MacKenzie Center, had Amur cork trees planted there long before it became a regulated species. Since then it has spread throughout the property and onto a neighbor’s land. 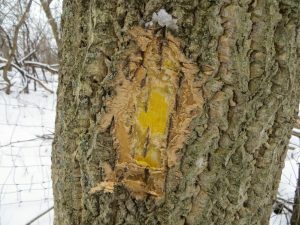 DNR staff is working, along with the Lower Chippewa Invasives Partnership in Dunn County and private plant control businesses in Adams and Dunn counties, to control Amur cork tree on both private and public lands. Single female trees in Dane and Milwaukee counties have been or are about to be felled. Where cork tree has spread into forests we find it more cost effective to control all small cork trees rather than wait until females are large enough to produce fruit. Michael Putnam, invasive plant specialist, michael.putnam@wisconsin.gov or 608-266-7596.